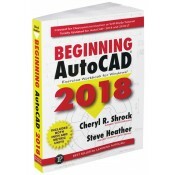 The Beginning AutoCAD® 2018 Exercise Workbook is designed for classroom instruction and self-study alike, and is now suitable for both inch and metric users to accommodate readers around the world. Each lesson starts with step-by-step instructions on how to master a particular task, followed by exercises designed for practicing the commands readers learned within that lesson. The 2018 version of the software boasts the new feature of being able to import SHX fonts when importing documents into AutoCAD. With past versions, you could only import SHX fonts as objects that were included in the PDF, which meant that users could not alter the text in any way. In this 2018 version of the software, the text is fully editable – the same as TrueType text and fonts. That’s a tremendous advantage for architects and designers, who use SHX fonts extensively in their drawings. Cheryl Shrock is a retired Professor and Chairperson of Computer Aided Design at Orange Coast College in California. The AutoCAD Exercise Workbooks are the result of both her teaching skills and her industry experience. She also is an Autodesk® registered author. Steve Heather has more than 30 years of experience as a practicing mechanical engineer, and has taught AutoCAD to engineering and architectural students at the college level. He is a Beta Tester for Autodesk®, testing the latest AutoCAD software, and a member of the AutoCAD® Customer Council.